Researchers across Harvard face a difficult climate when funding their research. Federal research funding, long a mainstay of academic institutions, has been largely stagnant in recent years. Institutional support from Harvard, while present, will never fully meet the needs of often-expensive medical and public health research. At the Harvard School of Public Health, professors are taking a different path to supporting their research. In increasing numbers, they are turning to private corporations for funding and assistance. Michelle A. Williams, dean of the School of Public Health, said last month that she aims to ensure Harvard faculty can compete for outside awards. “Only about 15 percent of our revenue comes from our endowment. So one of the strategies for the school of the previous dean and myself is to keep our high competitive position for sponsored research [and] work to continue to diversify our funding streams,” she said. Across the University, faculty received $45.8 million in research funding from corporations and $154.8 million from private foundations in fiscal year 2017, according to data from the University’s Office for Sponsored Programs. These figures have increased 16 percent and 45 percent since 2013, respectively. Federal funding, on the other hand, has slumped in the same time period, down about 4 percent. The school has taken on two large corporate-sponsored research projects in the last year. Last spring, Aetna and the school announced a partnership to examine employee happiness and health. Tyler J. VanderWeele, an epidemiology professor at the School of Public Health, cited the employee data that Aetna would make available as a major draw to the partnership. Employees will voluntarily take surveys over five years, the results of which Harvard researchers will analyze. In June, the University's Office for Sustainability and the School of Public Health joined with Google on a project to test the toxicity of chemicals frequently used in construction. At the time, Heather Henriksen, managing director of the office, said Google was a natural partner for Harvard because of their similar square footages, governance structures, and interests in transparency. Experts say this type of corporate-sponsored research offers an opportunity for additional funding, but can raise difficult administrative and ethical issues. The most obvious upside is financial. In a time when federal funding is less certain than before for academic institutions, corporate sponsors can help fill the gap. Nicholas H. Steneck, who directs a research ethics center at the University of Michigan, said faculty typically turn to corporate-sponsored projects in order to secure funding. “It’s just another source of funding. Government funds are limited; they haven’t been increasing. Most institutions don’t have a lot of money to fund research,” Steneck said, because they primarily direct funds to student financial aid and other expenses. “They’re always looking for more funding, and industry is an obvious place,” he added. The Aetna partnership, for example, came with several million dollars of funding for Harvard, although the company and the faculty involved declined to give an exact figure, citing confidentiality agreements. There are also, however, complications that sometimes arise with these arrangements. C.K. Gunslaus, director of the National Center for Professional and Research Ethics, cited intellectual property concerns as often arising in sponsored research partnerships. “Most universities have a set of guidelines about what intellectual property terms are acceptable from a sponsor of research,” she said. “Particularly if students are involved, the general rule of thumb is that it should be publishable." Steneck said there are relatively few government regulations in place addressing ethical concerns related to corporate-sponsored research. “Most privately funded research doesn’t fall under government regulations. The only exception to that is medical research that has to be submitted to the FDA for approval,” he said. The School of Public Health, and the University more broadly, have hundreds of pages of policies in place concerning sponsored research. The school’s conflict of interest policy, for example, specifically mentions that research sponsors should not have undue influence on scholarly findings. “Faculty members must not be induced by financial interests to give outside sponsors or other organizations or individuals authority to direct their studies or to restrict or unreasonably delay the release or publication of research results,” the policy reads. School policy also governs information sharing between professors and sponsors: Faculty cannot share confidential information with sponsors more than 30 days before planned publication. In September 2001, the Harvard Corporation, the University’s highest governing body, set out University-wide policies for collaboration and commercial enterprises, noting the opportunities for corporate-sponsored research. “At the same time, commercial activities can pose risks to the core values of universities, notably to their commitment to pursue and disseminate knowledge independent of economic and other extraneous pressures,” the policy reads. The Corporation mentioned public trust as one of the most important factors for the University to consider in evaluating projects. “The University should therefore scrutinize with special care any agreement that may appear to compromise public trust, even if University officials believe the arrangement does not otherwise jeopardize the integrity of teaching or research,” it stated. Michael J. Grusby, executive dean for administration at the School of Public Health, could not be reached for an interview for this story. 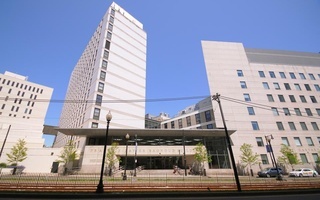 Earlier this year, conflict of interest questions received national attention next door at the Harvard Medical School. A Medical School researcher’s trial came under investigation and was then shut down by the National Institutes of Health after he was found to have wooed industry funds with promises that he would find positive health effects of moderate alcohol consumption. A month after Congress passed a budget easing federal research funding cuts that had gone into effect in early 2013, Harvard administrators said last week that while research prospects may be looking up, the future remains uncertain for scientific research. Although the School of Public Health’s rejection of these funds is not itself praiseworthy, we are glad that the it has upheld basic ethical standards for academic research.